As a new sales consultant at Sioux Falls Ford in 2009, I was enamored with the Ford Shelby GT500 on our showfloor. Until that point in my life, I had never seen one in person. And it was parked right next to my desk. I was glued to that Shelby GT500. 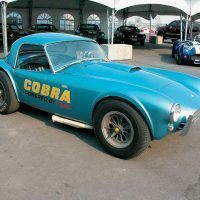 Shelby Cobra: The Snake That Conquered the World follows the story of Carroll Shelby, the man behind the infamous machine bearing his name. 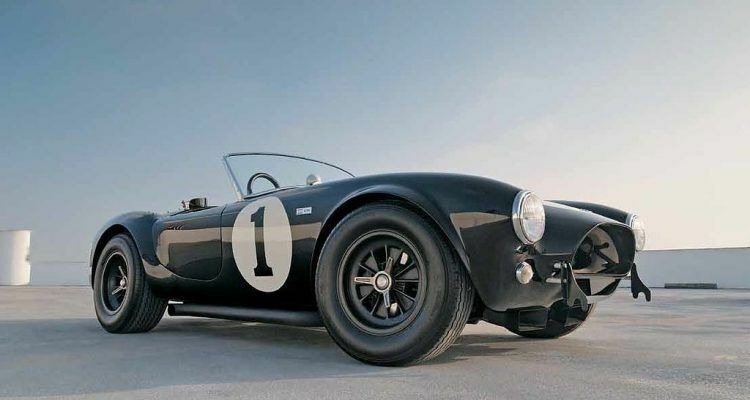 Shelby, in the 1960s, envisioned a line of performance cars so spectacular some might have called him crazy. Yet dreams, when combined with hard work, often come true. 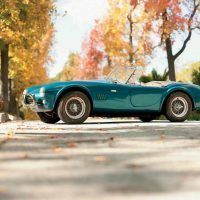 When Shelby’s Cobra appeared in 1962, he beat the odds against him and built a benchmark for performance. 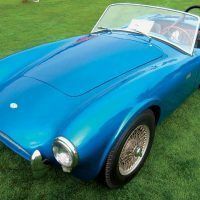 The book details this journey and what prompted this Texas farmer to build the now iconic cars. 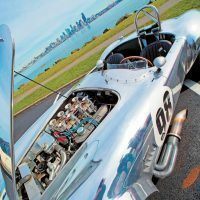 Colin Comer is the Editor-at-Large for Sports Car Market and American Car Collector magazines and a contributing editor for Road & Track. He lives in Milwaukee, Wisconsin, with wife Cana, daughter Remington, and a herd of dogs. 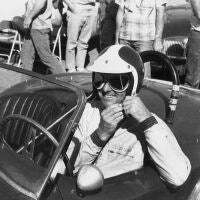 A new chapter features tributes to Carroll Shelby from Chuck Cantwell, John Morton, Henry Ford III, and Kati Remington-Blackledge, among others. Artwork is provided by Motorsport artist Hector Cademartori. The foreward is written by Shelby himself. The Mustang creates emotion, as we saw in a recent edition of our Book Garage series. Adding Shelby’s name to them amplifies that tenfold. 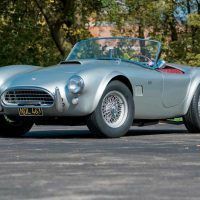 The cars this chicken farmer created are the ones people spend their lives dreaming about – I so badly wanted to sell one to a person just like that. I don’t think my career in the automotive industry can be complete until I do. I can’t explain why – it is what it is. Until then, on my messy desk in my tiny Detroit apartment, sits this book. I love how the Cobra emblem on the cover is raised so you can run your hands over it. Goodness knows what important matters I have sitting under the book: blood work results from my doctor, a contract, few bills, and a check. I should probably look at those things . . . but this book has conquered my desk and my wildest dreams, just like the Cobra conquered the world. *Available through Amazon and Motorbooks. 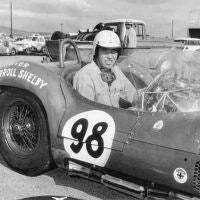 Carroll Shelby, the racer, is shown here in the Birdcage Maserati he so skillfully piloted, sans signature bib overalls. Shelby looks right at home. Note the race no. 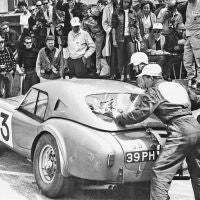 98, which would later become Ken Miles’ number of choice, and the Autolite sponsorship—odd, for an Italian sports racing car! 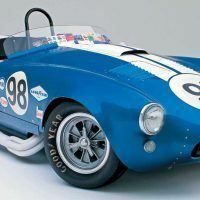 Courtesy of Shelby American, Inc.
Carol Connors wrote the song “Hey Little Cobra” at Carroll Shelby’s urging, and likely in large part for Shelby’s promise to give her a Cobra of her own if she did! 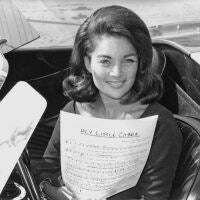 The song was a hit, and today ranks as one of the top car songs of all time. What you may not know is that Connors also wrote the holiday tune “Santa’s Got a Cobra,” or another more well known hit that she co-wrote: “Gonna Fly Now,” also known as the theme from Rocky. As Connors has said, “Hey Little Cobra” got her a Cobra, but the theme from Rocky got her a house in Beverly Hills. 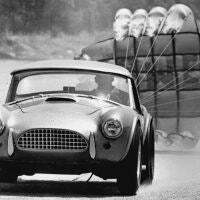 Courtesy of Shelby American, Inc. The ex–Barrey Robles unrestored Cobra, CSX2230, still looks great despite its 47 years and 132,000 miles of use. Note the artful fender flares and hood scoop done when new in preparation for its SCCA career that was never to come to fruition, thanks to an SCCA rules change. Everything happens for a reason, as they say. 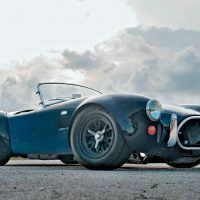 John Hollansworth Jr.
1 Comment on "Automoblog Book Garage: Shelby Cobra: The Snake That Conquered the World"
Great!! Eager to know more about Shelby GT500. Thanks Carl for sharing your experience.